I love eggs so I am always trying to find new ways to enjoy them. In my travels to Paris I have the tastiest memories of rich yet light and creamy egg custards. 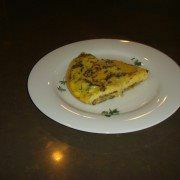 You often see a quiche and it has holes on the side and looks dry. A great quiche should have trouble holding its own wait. It should be without air bubbles, dense and silky. I wanted to try a different type of crust. I had some russet potatoes so I decided to do a “hash brown” crust instead of a pastry crust. 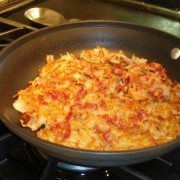 I shredded the potatoes with onion and made very crispy hash brown in the bottom of a non-stick pan. I then mixed together the eggs with some sautéed pancetta (bacon) and sautéed leeks and of course a touch of gruyere cheese and some thyme. I never like the egg to get colored so I always cook the filling, let it cool and then stir it into the egg mixture. This way you get a clean, bright yellow egg custard with yummy bits suspended in the egg. I poured this mixture onto the hash brown base and tossed it into a 300 degree oven. Eggs do best with a lower heat. A slow gently setting of the eggs is key. When you still have what looks like a slightly runny center you take it out of the oven. Just like scrambled eggs. The key is to have a little shine on the eggs and then you know they won’t be dry. You cut into the custard and your fork falls straight down until it hits the hash browns which have know softened but still have a nice chew and crunch to them. You get bits of salty bacon, creamy gruyere chz and a nice sharp, sweet crunch from the leeks. Thyme throws a warm blanket over your tongue and allows all the flavors to come together. Quick, simple and so tasty. Enjoy!